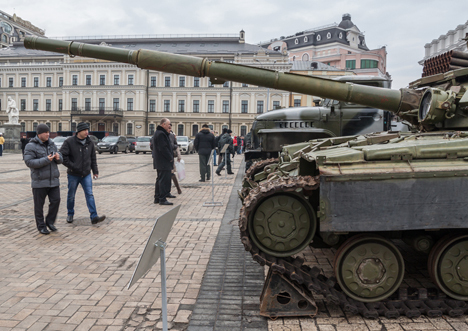 As both Russia and the West celebrate the seventieth anniversary of the victory over Nazi Germany, which laid the foundations of the European post-war order, the conflict over Ukraine puts decades of stability and peace on the continent into question. Some observers see Russia’s conflict with the West as a clash of values.1 More than that, it is also a clash of different visions of the past, different cultures of memory. While in Europe the Ukrainian Maidan protests were seen as the country’s delayed ’89 moment, a popular movement for democracy and human rights, Russian officials and media presented the demonstrators as radical nationalists and “fascists” – direct heirs of the Ukrainian Nazi collaborators defeated by the Soviet Army in 1945. 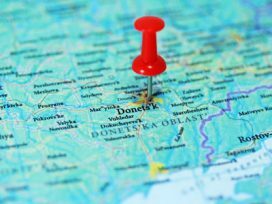 The war in Donbas, which was provoked and supported by Moscow, has been narrated in Russia as a war against Ukrainian “fascism” that threatens Russians in Ukraine. The fact that millions of Russian citizens have fallen for this propaganda can only be explained by the fetishization and mythologization of the “Great Patriotic War” during the last decade. In the beginning of the war in Donbas, long before Russia had crammed the region full of its weapons, pro-Russian separatists in a small town told journalists that the tank they used against the Ukrainian army had been taken down from the plinth of a local war memorial, repaired and refuelled. Regardless if the story is true, the metaphor is powerful enough – it suggests that the ghosts of a war that ended 70 years ago are easily evoked. 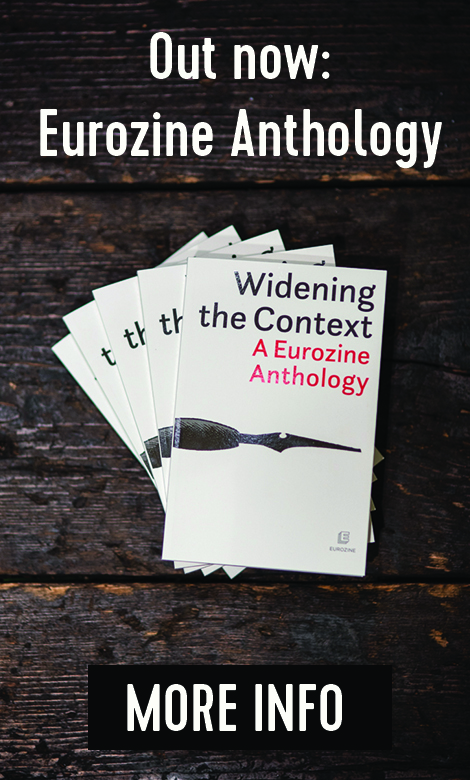 In post-Cold War Europe, the politics of memory has in fact often been about geopolitics.2 The fight for hegemony on the European continent is disguised as a conflict of historical master narratives, in which World War II plays a major role. The “old Europe” sees the end of World War II in 1945 as the zero-hour of a new democratic and liberal order, where the memory of the Holocaust and Nazi crimes serves as the foundation for a new universal culture of human rights, something we often refer to as “European values”. 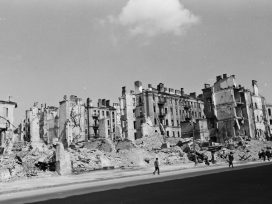 At the same time, for the countries of the “new Europe”, the end of World War II appears not to have truly occurred until the end of the Cold War. For them, the legacy of communism as a result of the post-war political division of the continent still needs to be critically addressed, and the European Union has to recognize communist crimes if it is serious about common European memory and identity. Insofar as Russia is considered a part of Europe, it presents a third narrative, basing its post-Soviet national identity on the triumphalist memory of victory over Nazi Germany. In this way, Russia seeks equal recognition by the West as one of the European powers and at the same time tries to debunk the “revisionist” memory politics of its western neighbours. The beginning of memory wars in the post-Soviet space can be dated back to 2005, when the sixtieth anniversary of the victory over Nazi Germany was pompously celebrated in Moscow and turned into a loyalty test for the politicians of the neighbouring countries.5 Or one could start even earlier, with the Orange Revolution, when the Russian spin-doctors of Viktor Yanukovych used the “Nazi” label to compromise his pro-Western political opponent Viktor Yushchenko in the 2004 presidential elections. 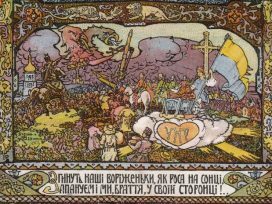 In the following years Moscow entered into a bitter dispute with Kyiv over the role of Ukrainian nationalism in World War II and over the interpretation of the Ukrainian Famine as genocide. 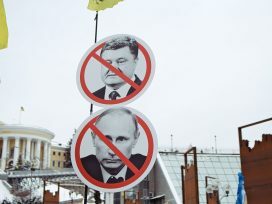 Local opponents of Yushchenko dubbed his rule an “Orange plague” (an allusion to the term “brown plague”, a Soviet-era metaphor for fascism) and, with the support of the Kremlin, created “anti-fascist” movements and political alliances. By the mid-2000s, in a sort of transnational populist move, Moscow started to address ethnic Russians and Russian speakers in the former Soviet republics, appealing to the memory of the Great Patriotic War as shared symbolic capital and accusing the respective national elites for being nationalist and anti-Russian, tolerant to Nazi collaborators, or even neo-fascist. “Victory over fascism”: Russia’s soft power? How and why has the memory of World War II, or the Great Patriotic War in its Russian version, become the core of Moscow’s return to geopolitics? After 1945, the symbolic capital of the Great Victory served as an entry ticket for the USSR into the club of great powers and legitimized its role in the European post-war order. After the collapse of the Soviet Union, the victory over Nazi Germany was Russia’s only remaining positive legacy of the Soviet era. However, the pro-Western Yeltsin leadership made little use of it; it was only with Putin’s return to the idea of a “Great Russia” that the Great Patriotic War became a link connecting the pre-revolutionary imperial glory of Russia to the hope of a new revival. With European Union and NATO enlargement to the east, as well as Russia’s recovery from the economic crisis of the 1990’s, the victory over Nazi Germany was instrumentalized by Moscow to legitimize Russia’s right to participate – on equal footing with “old Europe” and the United States – in shaping the architecture of the post-Cold War order, and especially of the future of Eastern Europe and the post-Soviet space. A politics of memory focusing on Russia’s fight against Nazism during World War II served to counteract efforts towards a “de-colonization of memory” in the former Soviet countries and to keep them in Moscow’s geopolitical orbit. Some observers suggest that the memory of World War II is Russia’s form of soft power: “The soft power of the West and China is based on an attractive vision of the future. By contrast, Russia’s soft power looks to the past, mobilising the memories and legacies of an imagined and real common history. 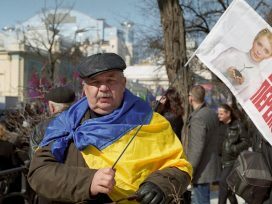 This is part of what makes Russian soft power so specific”.6 What we have witnessed in Ukraine in 2014-2015 is, however, something new: with anti-fascist discourse being used to incite pro-Russian insurgence, the memory of the Great Patriotic War has become an element of Russia’s newly-discovered hard power. In the last decade Russia’s political elite has increasingly considered the post-Cold War order on the European continent unfair and inattentive to Russia’s geopolitical interests. The turning point was, however, the Ukrainian Maidan Revolution. Since the annexation of Crimea in March 2014, Russia has emerged as a revisionist power under the banner of a “fight against fascism”, this time against the new Kyiv leadership, which is depicted as a re-incarnation of “fascism”. The Maidan Revolution, the mass uprising against the corrupt and authoritarian Yanukovych regime, has been described as a fascist putsch (supported by the West), the new Ukrainian government as a fascist junta, and pro-Russian separatism in eastern Ukraine as an anti-fascist fight waged by ethnic Russians against the Ukrainian Nazis who have come to power in Kyiv.7 The annexation of Crimea has been presented as a successful Russian operation to save ethnic Russians – or “compatriots”. From the Russian perspective, the conflict in and around Ukraine has thus become a reincarnation of the Great Patriotic War.8 Once again, Russia has turned to its eternal historical mission of preventing the return of fascism. 1. In the current Russian-Ukrainian conflict , the linear historical time has collapsed and history repeats itself: seventy years after the victory over German Nazism, Russia claims to be facing the same challenge – the threat of fascism. This is only one symptom reflecting the total confusion between past and present that haunts Russia’s society and politics. Reflecting on the Medvedev era, Ilia Kalinin in 2011 called his politics “nostalgic modernization”, since the belief in the future success of Russia’s modernization was derived from its “great past”. In other words, Russia was supposed to move forward even if looking back nostalgically. 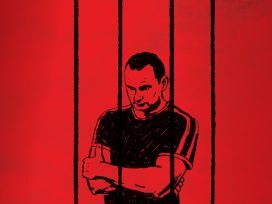 This new nostalgia, according to Kalinin, does not have to do with “the desire for the return of a lost object; it ceases to be a stigmatizing marker of social defeat, harbouring the threat of a revanche in the future” – meaning that, in his eyes, the explosive Soviet past has turned into a harmless “cultural heritage”.9 Well, this is evidently not true anymore after the “Russian Spring” 2014, when a hard-core “restorative nostalgia” became the driving force of Putin’s politics. 2. The new politics of memory is pervasive: it stretches from official discourse and diplomatic rhetoric to mass media, cultural production (films, performances, even operas) and academic history writing. And so it happened that a recent international academic conference on the history of Nazi war crimes turned (to the surprise of the Western participants) into a tribunal on the “Kyiv junta”.10 Another example is when Russian state TV shows fake eyewitnesses telling stories of “fascist crimes” in Donbas; or the Investigative Committee of the Russian Federation opens a criminal case on the “genocide of Russians in Eastern Ukraine”. 3. We have seen how quickly harmless war re-enactments as a collective hobby can turn into launching a real war. Indeed, the military conflict in the east of Ukraine is represented and perceived as a re-enactment of the Great Patriotic War: Russia’s never-ending war against fascism. Historical re-enactments of World War II battles, which have become so popular in the post-Soviet space in recent years, have turned out to be far from innocent. It was not by chance that the first generation of pro-Russian fighters was recruited from this milieu. This new temporality that results from the fusion of the past and present, of the real event and its theatrical performance, is another horrific feature of the war in Donbas. One example is the seventy-first anniversary of the liberation of Donbas from Nazi occupation, which was celebrated in Donetsk on 8 September 2014 as a victory over fascist Kyiv after the defeat of the Ukrainian army near Ilovaisk.11 Another example is the infamous “parade” of Ukrainian war prisoners in August 2014 in Donetsk, which imitated Stalin’s parade of German POWs in 1944 in Moscow.12 This performative character of the war in Ukraine – as a re-enactment of the Great Patriotic War – disguises the real causes of the conflict and helps to deny responsibility for its consequences. 4. Some researchers have already noted that the commemorative performances and Victory Day celebrations in Russia in recent years have little to do with “memory work”(Erinnerungsarbeit) but rather with “orchestrating collective emotions”. Serguei Oushakine, who has extensively analysed the contemporary re-enactment of the historical military parade of 7 November 1941 on Red Square, has called this phenomenon “affective management”.13 The annexation of Crimea and the conflict in Donbas can be seen as a version of this “affective management” operating on a different level. According to Serhiy Kudelia, the resentment and fear triggered in the Russian-speaking regions in the east and south of Ukraine by the overthrow of the Yanukovych regime served as one of the domestic factors of separatism.14 These emotions were amplified by Russian media and instrumentalized during the pro-Russian “referendums”, first in Crimea and later in Donbas. 5. One of the intentions of Russia’s new memory politics is the destruction of Ukrainian national identity. Russia is fighting fascism in Ukraine, but there is no Russian invasion – how it this possible? The logic is simple: eastern Ukraine is considered de facto Russian territory: it’s part of the pseudo-historical region of Novorossiya. Moreover, the post-Cold War European order is unfair, from the Russian perspective, as the new post-Soviet border cuts through a unified Orthodox civilization, the centuries-old Russkiy Mir, of which Ukraine is an integral part. While Russian politicians speak about the “brotherly Ukrainian people”, they deny the legitimacy of an independent Ukrainian state and Ukrainians’ right to decide their geopolitical future themselves. In the Russian geopolitical imagination, contemporary “Ukrainian fascists” are those who insist on a separate Ukrainian identity and want their country to become part of the West. 6. “Antifascism” has thus become a central element of the new national idea and the motor of mass nationalist mobilization in today’s Russia. This “antifascism” addresses both internal and external publics: Russia’s own population and Russophones in the near abroad on the one hand, and the West on the other. With regards to the internal public, Russia’s crusade against “neo-fascism” in Ukraine and the Baltic states serves to mobilize and consolidate Russian society around a nationalist agenda, providing it with an “enemy” that resonates with the still-powerful narrative of the Great Patriotic War. Interestingly, the new Russian nationalist / imperialist discourse associates the revival of fascism and neo-Nazism in Ukraine with a Western conspiracy. Accusing the West of silent support for neo-Nazism (and evoking Russia’s historical mission of preventing its return to Europe) is part of a rhetoric that has its roots in the anti-Western propaganda of the Soviet era. At the same time, “Russia’s fight against fascism” in Ukraine and the Baltic states is a strong message to the West, above all to Europe, but also the US and Israel. Depicting the pro-western political elites in the post-Soviet states as fascist, Russia presents those states as a failed experiment in nation building (Ukraine as a failed state) and admonishes the countries of old Europe to reconsider the post-Cold War order in eastern Europe.